Artable founder and teacher Gillian Grove works behind the scenes to bring you the best art classes, workshops & travel experiences in Australia. Gillian is renowned for her ability to work in a range of mediums and styles and is highly sought after teacher for beginners. Gillian has been a practicing artist for over 20 years and is passionate about making art available to everyone, both adults and children, regardless of what skill level they possess. Gillian holds a strength in being able to break down complex concepts so that they are easily understood and works behind the scenes to design classes that teach the 'how to' in a fun and relaxed environment. Gillian is the ultimate teacher for beginners nervous about getting started in art. Anne Smerdon is a Gold Coast artist represented by galleries in Australia, New York and the UK. Specialising in watercolour and drawing, Anne's illustrative style stems from her background in fashion and architecture. From a very early age, Anne was noted as a creative-to-watch and was the winner of a Children's Creative Art Scholarship from the Queensland Art Gallery at the age of 11. In more recent times, Anne was the winner of the Element Eden Global Artist Search in the Fine Art category and also the winner of the Emerging Artist Award at the Trinity CollegeArt Award. She has also been a finalist in numerous art awards, including the Border ArtPrize, St Sebastians Emerging Artist Award and the Minister's Art Award. Seabastion Toast lives and works on the North Coast NSW. Among her achievements she won the 2011 Gainsborough Greens award and the 2014 Darcy Doyle award and is regularly a finalist in many prominent awards including the Doug Moran, Gold Coast City Art Prize, Sunshine Coast Art Prize and EMSLA award to name a few. Her paintings are a muse on the human condition and span all genres from still life to portraiture to landscape. Toast has a degree in fine art from Southern Cross University and has also studied at the Pratt Institute in New York. She has exhibited widely and is represented by Anthea Polson Art Gallery. She also loves teaching, trail running, surfing and horses. Denise Scott's passion for watercolour is proof it is never too late to start learning! After joining an art class for the first time only 12 years ago without being able to "draw a straight line", Denise has developed her love for watercolour into a full time passion. Denise trained in the art of pure watercolour and passes these skills along with a deep seated belief that 'anyone can learn' onto her students. Denise's stunning artworks hang in private collections around Australia and her love of travel has allowed her to hone her painting skills both in Australia and overseas. One of the region's best primary school Art Teachers, Jenny Porter has extensive experience teaching art to young children. Jenny's teaching career and passion for children's art education has spanned decades and she is currently a specialist art teacher in NSW primary schools as well as a practicing artist. In addition to being an exhibiting artist with the prestigious Anthea Polson Gallery in QLD, Jenny holds a diploma in Painting and a Visual Art Teacher Certificate. Local artist Susan Gourley is renowned for her incredible Mixed Media artworks where she draws from mixing everyday materials with paints to produce her simple yet stunning creations. Susan has designed a kid friendly process that even our youngest budding artists can follow. You will want to frame the finished creations! Marianne's creativity holds no bounds. With a Bachelor of Fine Arts and a Diploma of Education, Marianne is a sought after visual arts teacher and renowned for her incredible 3d works in sculpture. Our incredible crafter extraordinaire Lesley has been working with our Kingscliff kids for many years via our local Mini School and since Artable's first holiday program. Lesley's passion for the arts is as incredible as her loveable nature and easy to follow instructions. Come and see why kids flock to her classes. Karen Hughes is a local teacher and a mixed media artist. Spending as much time as possible painting in her Terranora studio, Karen creates textural pieces which are tangible and tactile as she upcycles papers and household findings, uses collage, acrylic paints, stencils and resin in order to establish layers on her canvases. Karen brings a passion to encourage others to find their own creativity and artistic enjoyment through art, no matter what the skill level. She believes that mixed media art can be enjoyed by anyone that loves to be creative and that it allows a wonderful scope for success that is creatively exciting, social and positive. Karen's students will be amazed at what they can achieve when they expand their own ideas via learning new skills and exploring a variety of art mediums in a fun environment. Listed in Who's Who in American Art, Judith Carducci has received international recognition as one of today's best portrait painters. Her work has been shown in such venues as The National Arts Club and the Salmagundi Club in New York City, the Cahoon Museum of American Art, and the Butler Institute of American Art. She has been featured in International Artist, Pastel Artist International, American Artist, The Pastel Journal, The Artist's Magazine, and the books, Best of Portrait Painting and Best of Pastel (North Light Books), "100 Ways to Paint People" (International Artist), and Portrait Highlights (American Artist). Her work is in collections in the United States, Canada, Puerto Rico, Israel, Europe and South Africa. Her paintings have won Best of Show, Award of Excellence, First Place, Award of Merit, and purchase awards at international and national shows and competitions. She is a Signature member of the Portrait Society of America (board & faculty) and the Pastel Society of America; a juried member of the Degas Pastel Society, the Cincinnati Art Club and the Salmagundi Club. She is also a Signature member of Akron Society of Artists and Hudson Society of Artists. She is also a member of the International Association of Pastel Societies and of Phi Beta Kappa. Judith is represented by Portraits Inc., and Portraits South. She teaches workshops in portraiture, pastel, plein air landscape, anatomy for portraitists and still life by invitation. John Turton holds an array of awards, residencies and teaching experience spanning 4 decades. A master of capturing the essence of the Australian landscape, John's artworks hang in numerous galleries including The National Gallery in Victoria and numerous Council, Private and Overseas collections including Robert Holmes A Court (WA). John has been published in a number of magazines and now brings his wealth of knowledge of the Australian landscape to Artable for his 2 day weekend workshop. Kimberley S. Moore studied Fine Arts at the University of Akron. Her work has been juried into and received into numerous awards regionally and nationally in the USA. Kim's work has been exhibited in the prestigious Butler Institute of American Art as well as the Degas Society's Biennial National Pastel Exhibition. Kim especially enjoys painting plein-air and capturing the mood and atmosphere of the locations she paints. Kim's passion has led her to paint in France, Spain, Portugal, The Netherlands, Czech Republic, Romania & the magical Monhegan Island in the USA. Kim is a signature member of the Pastel Society of America, a juried active member of the Degas Pastel Society, a member of the Portrait Society of America and a signature member of the Akron Society of Artists. Belinda is a cross-disciplinary folk artist, covering a range of styles in both digital and traditional mediums. Born and bred in the wake of an extinct volcano, & after completing a Bachelor of Visual Arts at SCU, Belinda moved to the big smoke for a spell. She then set off to traverse for several years before returning to Australia and studying illustration. Belinda is currently working on illustrating a book of her short stories. Corinne has exhibited her paintings in Brisbane, Gold Coast & Melbourne for more than 10 years. She is a 3 time finalist in the Border Art Prize and has held numerous shows throughout Australia. An accomplished painter with a love of fashion, females, fabric and jewellery, Corinne combines a thorough understanding of paint and its application with her bubbly nature that endears her to students and lovers of her art alike. Maria has a wealth of experience both as an exhibiting artist and art teacher. She holds a B.A.visual art and a Dip Education having taught in highschools and adult education. She has won many awards and her art is in collections in Australia and overseas. As part of her art practice Maria has used the medium of pastels. For over 35years she has explored and gained valuable skills in this medium which she shares in workshops and classes in an easy to understand and calm manner. Maria has taught all levels from beginners to advanced and can guide each individual towards gaining a greater understanding of how to use their mediums effectively to achieve their artistic visions. Martina received her arts training at the Peter Schneider Atelier in Germany and became a commercial illustrator for major companies, such as BP, BHP, Queensland Goverment, Channel Ten etc. She also finished a degree in Graphic Design at the QSPGA in Brisbane. and worked for five years as a senior art teacher at the Gold Coast Art School in Southport. She is former director of Ilustration House Pty Ltd, and The Art Directory. She has held numerous roles within the arts industry, including the presentation and lecturing of art business courses and discussion rounds for emerging artists and teaches art since 1999 and has now joined the teaching team of Artable to find more time for painting. Manuela has been a practising artist and teacher for more than thirty years working and exhibiting in the UK, Spain, and Australia. Her field of interest is life drawing and portraiture using oil or charcoal. Recently, she has won first prize for the 2016 Master Skill Building Challenge at Watts Atelier. In 2017 Manuela fulfilled a lifelong dream to study in Italy and attended the Florence Academy of Art allowing her to work with artists trained in the classical skills that Italy is renowned for. Her initial training was at Sheffield Hallam University (UK) where she studied a Fine Art BA Hons course and it is there that she discovered a passion for working with figurative art. Rikki Fisher is an accomplished artist with international recognition for her skills in scratchboard art. Rikki has been accredited as Master Scratchboard Artist (MSA) with the International Society of Scratchboard. There are only 17 artists worldwide who have attained MSA status. Rikki is motivated by her passion for wildlife. She is both proficient and versatile in the craft and well able to impart her extensive knowledge. Rikki has won National and International awards for her work. A resident of northern NSW, Rikki holds workshops and has given demonstrations at local, State and International levels. Her exquisite detailed works speak for themselves. Helen Beaver was born in Melbourne and completed her education in Brisbane, majoring in Art and Art History. Her love of drawing and watercolour painting evolved during her time at Art School and she has concentrated on Watercolour ever since in an endeavor to “master” this complicated medium. A winner of numerous awards, Helen’s work has been exhibited locally and internationally and has been recently published in World Wide Art Books, “International Contemporary Masters, 2013”. A respected teacher and tutor, Helen is in constant demand to conduct Watercolour workshops, particularly in South East Queensland where she resides. Jenny has been a beloved local tweed teacher for many years and holds a passion for connecting the arts with children. Kids love Jenny's structured approach with step-to-step guidance on how to finalise artworks. Jenny is passionate about mixed media, an art that encompasses many mediums using paint, paper, texture and pastel to finalise artwork full of colour and texture. Mo works predominantly with encaustic, paper, drawing and photography. Her work is usually based around the landscape, and likes to get out and about photographing, capturing elements of the landscape. These may range from deteriorated car park walls to rocks etched by the sea to rusty palette bins. "I find the traditional image of a landscape too overwhelming for me. I want to interpret the small, overlooked details. I look for pattern and shape in that landscape. I find that exciting to be able to see it in that way. The effects of nature and time and what they combine to do to all things are my inspiration. I teach encaustic all over Australia, travelling to wherever there is a call. We are now on the road in our caravan travelling through Australia and bringing creativity to as many places as we can. Setting up my mini portable studio space I can work in the open air and enjoy being part of the new place we are staying. Teaching this amazing medium totally inspires me, I love to see people getting excited about being creative. Students often spark something in me with an idea or query, it also gives me the opportunity to make new friends, explore new ideas and challenges and to connect with other artists." A native of Colorado now residing in California, Strand has been exhibiting professionally as an artist for over 30 years. Strand was inducted into the Hall of Fame in 2007, the highest commendation of the Pastel Society of America, NY. She is the recipient of numerous top awards, including the PSA Master Pastelist distinction and the IAPS Master Circle Honor. Her solo exhibitions in galleries and museums include a one-person retrospective of pastel and oil paintings at the Bakersfield Museum of Art in California. Widely published in books and magazines internationally, her work is also represented in many corporate and private collections. Strand studied at the American Academy of Art in Chicago and at the Art Students League and National Academy of Design in New York. She earned a BFA degree from the University of Denver and an MFA from Laguna College of Art and Design. Strand teaches workshops and master classes internationally and around the country. I relate to small moments of life that are often overlooked. These moments resonate with me because they are familiar—we see ourselves in them. They sometimes suggest things beyond the obvious. Painting mundane objects or tasks provides me with a challenge to portray the commonplace in a compelling way, to make the usual unusual and worthy of notice. My current body of work, painted with oil and pastels on canvas and paper, depicts moments in everyday life as experienced by the people most significant to me. My paintings have subtle, suggestive narratives: singular moments of life in the world, slices of daily life, the implied passage of time. They bring together my interests in abstract shapes and formal space combined with naturalistic figures and the many nuances of light. Through the familiar and commonplace content of these paintings, I attempt to explore emotion and mood as a form of visual poetry. 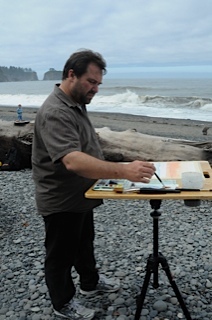 Richard McKinley has been a professional working artist for 38 years and has over 35 years of teaching experience. In 2010 he participated in the American Masters Exhibition at the Salmagundi Club in NYC and was inducted into The Pastel Society of America’s Hall of Fame at the National Arts Club in NYC. His work is represented in several national galleries and is in the permanent collection of the Butler Institute of American Art Museum. He is a frequent contributing editor for the Pastel Journal Magazine. American Artist magazine profiled Richard in their January 2008 issue with an article titled: “The Dance Between Artists and their Paintings”, by M. Stephen Doherty. The July/August 2010 issue of Artist magazine features an interview by Christine McHugh titled: “Shimmering Water, Quiet Light”. The Fall 2010 issue of Workshop Magazine featured an article by Linda S. Price titled: “Tackling Three Key Challenges of Plein Air Painting with Oil and Pastel”. The August 2011 issue of Southwest Art Magazine featured an interview of Richard by Mark Mussari titled: “Misty Memories”. His work has been included in several books including: “A Painters guide to Design and composition”; “Painting with Pastels”; “Pure Color, the best of Pastel”; “Art Journey America Landscapes”; “Sketchbook Confidential”; and the French book “les maitres du pastel”. A book that compiles years of his published Pastel-Pointers columns and blogs for the Pastel Journal Magazine titled: “Pastel Pointers, Top Secrets for Beautiful Pastel Paintings”, was released by North Light publications in November 2010 and was an instant bestseller. Two instructional DVDs: “A Studio Session, Pastel”; and “A Studio Session, Oil” have been produced by Artist Productions and F+W Media, parent company of The Pastel Journal and Artist Magazines, released two videos on pastel painting in early 2010. An avid plein air painter, Richard divides his time between painting the locations he is passionate about, reinterpreting those paintings back in the studio, writing about art matters, and instructing workshops. Herman Pekel was born to Dutch parents in Melbourne, Victoria in 1956. Herman was the winner of the Camberwell Rotary Watercolour prize in 1993 and was previously three times a finalist in Camberwell’s Travel Scholarship Award, winner of the 1989 Camberwell Watercolour Prize and also the Travel Study Scholarship in 1989. He has also won many other awards, including the Camberwell Rotary Art Show’s Best Oil in 2004, the Camberwell Rotary Watercolour prize in 1989, 1993, 1995 and 2006, the Camberwell Rotary Travel Scholarship in 1989, and in 1989 and 1993 he won the Alice Bale Award. In 1994 the National Taiwan Art Institute asked Herman to participate in a book and travelling exhibition with selected artists from Australia, USA and Taiwan. Herman exhibits his work regularly in the USA. Tricia Reust is a visual artist working in most media. She exhibits regularly, teaches, judges competitions and is active in the arts community. Tricia won the National Mortimore prize in 2012; has had work accepted ten times in the Bald Archy National Touring Exhibition; recorded an episode with the Television series Colour in Your Life; and has been published in several issues of the Australian Artist and all three “Incite – The Best of International Mixed Media” publications. Her instructional DVD s “Drawings and Mixed Media”, another on Drawing and one on Texture, are available through Pulsar Productions. Tricia is a Master Pastellist with the Pastel Society of Australia, and is a member of Artists in Redcliffe; the Portrait Society of America; the Redcliffe Art Society; the Bribie Island Art Group and the Moreton Bay Regional Arts Council. Her awards cover many themes and media including pastel, portrait, mixed media and miniature. I have been painting and drawing through my entire life, dedicating the last two years to painting full time. I feel something has been lost with the broader abandonment of beauty in art and it's ability to feed the soul, inspire and bring hope. I am on a journey to bring my vision and emotion into my work, which fills me with a great sense of satisfaction and fulfillment. Born in Melbourne, Australia and now living and working in the Mt. Tamborine Hinterland. Howards early years were working as a signwriter and screen printer. He also worked until recently as a set designer, concept artist and prop maker at Movie World. Working primarily in oils and charcoal, Howard takes inspiration from classical and contemporary artists alike. Focusing on beauty and aesthetics, Searchfield strives to capture the essence and emotion of the subject or concept he is expressing through his chosen medium. An obsessive painter, he has studied with artists Tony Champ, Dirk Vanderlindt and more recently with Adelaide artist Robin Eley and Brooklyn N.Y artist David Jon Kassan. Currently exhibiting at Hillier and Skuse Gallery, his paintings and drawings hang in the homes of collectors both nationally and internationally. David Wells was born 1977 into an artistic family. He is an eclectic artist having worked professionally as an actor, graphic artist, dancer, web designer, circus and street performer, musician, children's entertainer and visual artist. He has exhibited extensively, and has been award over 30 prizes for his art. Australian born, Heidi Willis is an entirely self-taught Natural History watercolour artist. Her work intricately illustrates our native and exotic plants, flowers, fruits and seed capsules, whilst her powerful & distinctive portraits of our spectacular bird life offers viewers an insight into the world as she experiences it. Painting full-time since 2003, Heidi quickly established herself as one of Australia’s emerging artistic talents. Her reputation as a leading natural history, wildlife and botanical artist is well established and her meticulous and intricate studies of botany and birds can be found in significant public and private collections around the world. Heidi’s work has featured in prominent national and international exhibitions over her career. Highlights include The Waterhouse Natural History Art Prize six times to date, winning a Highly Commended award in the Works on Paper section in 2014 resulting in her work going on tour with the prize winning entries. Her major work St Vincent’s Amazons and Cannonball Tree has just been selected as a finalist again for the 2016 exhibition. The Waterhouse Natural History Art Prize is one of Australia’s most prestigious and richest art competitions held by the South Australian Natural History Museum. Several of her works have been showcased as a finalist at the Focus On Nature exhibitions, a leading international Natural History Art Prize held in the New York State Museum. Her work has also featured and won awards in both Botanica and The Margaret Flockton Award, hosted by the Royal Botanic Gardens, Sydney. Her work is held in the permanent collection at the Hunt Institute for Botanical Documentation PA, USA and her work has also been included in the highly regarded Shirley Sherwood Collection. Her work has also been featured in several publications, most significantly Better Homes and Gardens Magazine, Craft Arts Magazine, Colophon, SA Life, International Artist Magazine and Artist’s Palette Magazine multiple times over, with her work featured on the front cover of Artist’s Palette issue 123. In 2015 she was taken on by Australian Geographic as a freelance botanical illustrator where her work features in the Nature Watch section of the magazine. Sandra is self taught and has been a professional artist and illustrator for more than 26 years. During this time she has had a cartoon strip running for 8 years, designed numerous corporate logos, worked with the RSPCA, the Qld Police Force and quite a few City Councils as a cartoonist and illustrator. She has taught realistic drawing at numerous primary schools with a focus on conservational education, designed and made theatre costumes and sets as well as taught stage make-up, she has designed and made unique jewellery, illustrated 9 childrens books and written and illustrated 3 more. In 1998 she started to organise art exhibitions for art groups and the Inaugural International Wildlife Exhibition in 1999, which took 2 years to organise, was a major challenge with 20 overseas artists exhibiting beside Australian ones. After previously holding the positions of President, Treasurer, Secretary and Editor, Sandra is again holding the position of President of the Qld Wildlife Artists Society Inc. Although in previous years Sandra has exhibited a few times a year at the bigger shows, she finds it harder these days as her originals sell quickly and she is unable to keep up with demand. Her limited edition geclee reproductions sell well and are available from her website. Concentrating her energy now on painting the worlds endangered species Sandra works in all mediums and is especially keen on mixed medium paintings. She is an art judge, an art teacher working with adults and children, a popular workshop tutor and is a product demonstrator for Faber-Castell. Sandra is also an internationally recognized Bodypainter working in advertising, special effects, film and events such as ComicCon and SuperNova as well as privately. Sandra is an active member of many wildlife and conservation groups locally, nationally and internationally. Each year she chooses two local and one international wildlife conservation group to donate original artworks and limited edition giclee reproductions for fundraising. A percentage of many or her originals are also donated to 'good causes'. She insists that all funds raised from her donated paintings and prints are used for the cause and only supports groups where either ALL workers are volunteers or there are only a few paid workers. This is one of her solutions to deciding who she can help each year from the huge number of requests she gets to donate art and prints. Kim work with our juniors to create fun filled creative art classes in Robina. and oil, both in Australia and overseas. along with an instructional DVD-“Summer Light in Watercolour”-available wordwide. unifying shapes and relationships that will enable a painting to work as a design! Born in New Zealand, Michelle moved to Australia in 1985. She has been working as a professional artist since 1996 and has studied both in Australia and the UK. She has twice represented Australia at the Inter-Continental Biennale of Small Graphics and been shortlisted for many major art prizes including the Jacaranda Drawing Prize 2014, Portia Geach Art Award, (Highly Commended), The Bendigo Drawing Prize, The Wilson Art Award, The Northern River's Portrait Prize and the Waterhouse Natural History Art Prize. She has also illustrated 3 children's books and was shortlisted for the CBCA 2009 Crichton Award for Best New Illustrator. Michelle lives and works in a converted church near the coast in rural Australia. My work is figuratively based and invariably incorporates animals. I am drawn to the aesthetics and lines of improbable looking creatures such as cheetahs, hyenas, dodos, tasmanian tigers and kangaroos. I am intrigued by the point whereby the domesticated and civilised meets the wild and instinctual and how these opposing natures interact, inform and/or thwart each other. The animals; be they real beasts or imaginary monsters have been used over the years of my art practice, as a vehicle to express this conundrum. At other times I have simply attempted to convey the ineffable beauty a wild thing stirs in me, to capture the strange and miraculous otherness that has in itself captured me and my attention. And also to speak of the great loss and sadness when a creature becomes, or tetters on the edge of extinction. My love of reading, both fiction and non-fiction, also strongly informs my art practice and has been the catalyst for many paintings and drawings including a body of work around the subject of mythical monsters. In recent years I have also moved into the genre of portraiture. With both the animal and human artworks I strive to evoke the essential nature of my chosen subject matter. I see the actual process of focused drawing and painting as the means of incantation by which this is achieved. Over a career span of more than forty years, Alan Flattmann has become recognized as one of the most influential and respected pastel artists in the country. He is a Pastel Society of America's Hall of Fame honoree and is an Eminent Pastelist in the International Association of Pastel Societies. As well as receiving many awards and honors during the course of his career, Flattmann's work is featured in many art books and magazines such as American Artist, The Pastel Journal, Pastel Artist International, Watercolor, Southwest Art and the French magazine Pratique des Arts. His work has also been shown in over 60 solo exhibitions and included in major group exhibitions in the USA, France, Columbia, China and Taiwan. In addition, his paintings are found in the public collections of the Hang Ming Shi Pastel Art Museum (Suzhou, China), The Butler Institute of American Art, The New Orleans Museum of Art, Ogden Museum of Southern Art, Oklahoma Art Center, Longview Museum of Art, Mississippi Museum of Art, Lauren Rogers Museum of Art, Sarah Gillespie Museum (William Carey University), St. Tammany Parish Justice Center and Alton Ochsner Medical Foundation, as well as hundreds of private and corporate collections. 1964-1967 Studied at John McCrady School of Art in the French Quarter. transition to pastels as favorite medium. New Orleans, Jackson, Birmingham, Dallas, Atlanta & Palm Beach. 1981 Publication of The Poetic Realism of Alan Flattmann by Joyce Kelly. The book featured paintings of New Orleans, Barbados and the rural South. First featured in Who's Who in American Art and every year since. 1982 Solo Exhibition at the Oklahoma Arts Center, Oklahoma City, OK.
1985 "Best of Show" - Kansas Pastel Society National Exhibition. Traveled and painted in Greece collecting material for future shows. 1987 Publication of The Art of Pastel Painting by Alan Flattmann. Exhibited in Salon International Du Pastel - Paris, France. 1991 Awarded Master Pastelist designation, Pastel Society of America. Traveled and painted in Guatemala collecting material for future shows. 1996 The American Artist magazine’s Art Masters Teacher Award for Pastel. Sept. 28, 2002 proclaimed Alan Flattmann Day by Mayor of New Orleans. 2004 "Best of Show" - Eighth Biennial Nat. Exhibit, Pastel Society of N. Florida. National Arts Club in New York City. the Butler Institute of American Art. IAPS International Exhibition – "Gold Award." Publication of revised edition The Art of Pastel Painting. 2009 "Joseph V. Giffuni Memorial Award" - Pastel Society of America. "Visual Artist of the Year," St. Tammany Parish President’s Arts Award. Windsor Fine Art in New Orleans. Barnwell Art Center, Shreveport, Louisiana. Paintings featured in the Pastel Painters of Spain International Salon Exhibition, Oviedo, Spain. International Pastel Art Exhibition and Symposium in Suzhou, China. Liz Haywood-Sullivan, PSA-MP, IAPS/MC, is a representational landscape artist painting in the pastel medium. Her award-winning paintings are defined by strong contrasts and color, dramatic lighting, and graphic compositions, which often feature the interplay between man and the environment. Her artwork is represented by Vose Galleries of Boston, the oldest family-owned gallery in the US. In addition to her paintings, Liz’s current schedule includes teaching workshops nationally and internationally, along with judging and demonstrating for numerous pastel societies and art organizations. "What I value most in a teacher is the ability to know when to challenge and when to support, and you have that in good measure." Portrait artist Penelope Gilbert-Ng creates classically inspired contemporary custom oil and pastel portrait paintings for official, corporate and private commissions. Her oil portraiture brings to mind a level of craftsmanship and artistry that many believe no longer exists. Her paintings are inspired by the very sensibilities of the Impressionist Era. By combining superb draughtsmanship with subtle life-like color and deft paint handling, Penelope creates cherished heirlooms that reveal the true spirit of her subjects. Whether you wish to honor a beloved family member, recognize a momentous career achievement, or give that special someone a truly incomparable gift, you can commission Penelope to create an extraordinary, unique and timeless work of art. Penelope has been creating award winning artwork for over forty years. She is a consummate professional whose portrait paintings meld her great passion for painting with her never ending fascination for people. Her portrait paintings, are perfect examples of how a modern master of classical realism can incorporate a contemporary aesthetic with a classical painting sensibility to create a truly classic work of art. Penelope combines fine craftsmanship with her sensitive eye to convey the inner essence of her subjects connecting with them to capture a realistic yet not photographic likeness. Penelope’s award winning museum quality oil and pastel portraits are sought by collectors worldwide. She is represented in private and corperate collections. Penelope painted The Chief Minister Sir Michael Somare before he became Prime Minister of Papua New Guinea and this painting was a finalist in the Archibald and Portia Geach Portrait Competitions. She also painted a number of the Speakers of the House of Representatives Papua New Guinea.She has painted several department Heads of the University of Queensland. Selecting the best portrait painter to create your commission is an important decision. Since a well crafted oil painting will last for hundreds of years, you, and your ancestors will be looking at your commissioned portrait for a long time. It's important that you are one hundred percent satisfied with the result. Many of Penelope's clients are avid art collectors, and they want their portraits to be comprable to the museum quality paintings in their collections. Penelope is a true perfectionist and her credo - that her next painting be her best - keeps her constantly striving to reach even greater artistic heights. I am a painter that is who I am. I have painted all my life and continually studied, explored and enjoyed my learning processes on how I want to communicate visually to an audience. For me the effect of light on my subjects and the shadows created by a light source are in a sense equally important in creating the shapes, tone and composition required to make an enjoyable painting. I paint in all mediums but pastels’ spontaneous response and multitudes of hues and tones are so exciting especially when painting from life. I never cease to be amazed by the results. I don’t paint photographically but do believe in portraying and responding to what I see, simplifying and eliminating detail so as to make the viewer's eye work as well. My mark making is bold and confident yet shows a sensitivity to my subjects. When I paint the adrenalin flows and energy transforms into my work. I cannot think of any better way to spend my time than painting. We are truly blessed as artists. My teaching has been a wonderful source of learning as I have learned so much from my students. I first played with pastels over 40 years ago but seriously concentrated on using them for the past 25 years. I have found the speed of using pastel so wonderful when working with a model on a weekly basis as I love the individual skin colours of each model and how the light affects that colour. Pastel is the perfect medium to work from life. I hope that my paintings lift the viewer's spirit when they look at them. President Pastel Society of Australia 2 years. Awarded Life Membership of Pastel Society of Australia 2016 for service to the Society. Self-employed as Tutor at workshops 18 years Nationally and Internationally. Toowoomba Campus University of Qld, Mitchel School of Arts Bathurst. Grafton Arts School, ASOC Canberra, Victorian Pastel Society Australia. Pastel Society of South Australia, Pastel Society of Australia, Samford Art Group Coochie Art Group, Art Academy Brisbane, Brisbane Institute of Art, Atelier Art School, Art Club Lismore, Arts West Longreach, Wallabadah Art Group N.S W, Murrurundi N.S.W, Bundaberg Art Group, Royal Qld Art Society, Mackay Art Society, Scone Art Group N.S W, Eyre Art group. Mareeba Primary School, Private School at Atherton Tablelands. Morayfield High School 1 week Art program for Grade 10/11/12 Twice. Kingston Primary teaching wildlife drawing. Flying Arts tutor. Judge: Mackay Art Society, Brookfield Show, Rotary Sunnybank, Royal Qld Art Society, Annual International Miniature Art Awards, Beenleigh Rotary Art Awards, Woodford Biennial Art Awards, Maleny Art Awards, Caboulture Art Society, Watercolour Art Society, St Catherine’s Anglican 1st Inaugural Art Show, Qld Wildlife Art Society, Cloncurry Ernest Henry Art Awards, Longreach Arts West, RQAS Gold Coast, Art Whitsundays, Coochiemudlo Art Group Annual. Attended many workshops from 1990 to present day. 9 Articles published Australian Artist Magazine. 2000,2006,2009,2011,2012,2,13,2013,2016,2016. Finalist twice in Portia Geach Portrait Show. Paul Jackson spent his adventurous childhood in Starkville Mississippi. He discovered his passion for watercolor at Mississippi State University in 1985. He received a Master of Fine Arts degree in Missouri in 1992, and has since been relentless in pursuit of his creative dreams, receiving top honors in national and international competitions, contributing his art to a vast library of magazines and books and sharing his creative influence to all corners of the earth. Paul was the Grand Prize winner in the Paint Your Way to Pariscompetition and has been featured as one of the Master Painters of the World in International Artists Magazine. Jackson’s artwork has been on the cover of The Artist’s Magazine four times. Other media featuring Jackson’s work include American Artist, Watercolor magazine, Watercolor Magic, Watercolor Artist, Forbes Magazine, The New York Times, The Wall Street Journal, the Washington Post, NPR, CBS News, The Baltimore Sun, The St Louis Post, The Kansas City Star, and TWA’s Ambassador Magazine. Much of Paul’s portfolio of watercolors hangs in private collections, but some examples are on display in museums and public buildings. The Missouri State Capitol, Governor’s Mansion and Supreme Court all prominently feature Jackson watercolors. Although Paul has an unequaled passion for watercolor, his creative energy has not been limited to paper. He designed the Missouri Commemorative State Quarter for the United States Mint, created the stage backdrop for the musical Porterphiles at the York theatre in NYC, has thrice designed Presidential Easter eggs for the White House. Paul has also created several public art murals and glass mosaics, and is a frequent leader for charitable causes.In 2008, Jackson was the featured speaker at the International Watercolor Masters Invitational in Lushan, China. Paul was also the only American artist invited to the International Art Meet in Kolkata, India in 2011. Jackson frequently serves as judge for national and international art competitions. In 2009 he served as the invited juror for the American Watercolor Society’s 142nd annual international exhibition. A prolific artist and ambitious world traveler, Paul Jackson is one of today’s most versatile and visible contemporary watercolorists. Whether his subject is landscape, cityscape, portrait, architecture, still life or abstract, Paul captivates his audience with genuine emotion, intensity and finesse that energize each of his creations. Artist Nerida de Jong captures the essence of her life experiences in the rich, vibrant colors of her acrylic paintings. Her style is very natural with brush strokes flowing organically. Her attention to intricate and beautiful detail brings a reality to her work that draws you into the painting allowing you to share those experiences with her. Her paintings tell real life stories. “My works are just what they are—explanations of what’s happening around me at a particular time,” de Jong explains. Remembering the passion for drawing and painting that she felt from the age of three, the Australian Artist Nerida de Jong has spent much of her life in some of the most beautiful corners of the globe, from the exotic Cook Islands and Fiji, to provincial France and now to the breathtaking Greek Islands. These idyllic locations called “home” over the years continue to have a great influence on her artwork today. De Jong’s work is represented in galleries in a variety of countries and in many private collections throughout the world. New Zealand born, Queensland based artist, Kelly Southee enjoys travelling to capture new places and landscapes. Her first creative career was as an Interior Designer, giving her experience across corporate, retail, hospitality and apartment projects in the 1990’s. In 2001, Kelly was given the opportunity to concentrate on visual art while living in California. This proved a productive year with uninterrupted time to focus on painting. She has been painting and drawing ever since. The landscape has always been a strong theme in Kelly’s work. She aims to highlight our relationship with the environment, both urban and rural, in paintings featuring people and the places and spaces which they inhabit and often escape to. Kelly is available for private commissions, and offers her most popular work as Limited & Open edition reproductions. Kelly often sees inspiration for a painting while going about daily life. She finds delight in quirky or often overlooked elements within our urban environment: trees hugging road edges which are severely sculpted by traffic, or old buildings that might not be here next year. When time allows Kelly enjoys outdoor ‘en plein air’ painting with her pastels, paints and travel easel. Kelly uses a variety of mediums depending on what she feels best expresses the subject matter: pastels for their spontaneity and immediacy; oil paints on canvas for their rich ‘creaminess’; or high quality acrylic paints for their vibrancy and versatility. Both full time artists, Lucy & Barry McCann are a husband & wife team who produce works largely on a commission basis. Their demonstrations, teaching & judging skills are sought after by art societies and groups throughout Australia & overseas. They have achieved numerous prizes and awards with their work represented in many private & corporate collections. They have appeared on the TV series “Colour in your life”. Please find the link to their 4 episodes at their website www.mccannfineart.net.au under the heading “Resources”. Specialising in portraiture and children’s book illustrations, Sharon has been teaching art on the Gold Coast for over 25 years. She holds classes teaching both children and adults how to paint, draw and illustrate. Sharon also regularly holds workshops at her studio. Some of her accomplishments include; being an illustrator for the picture book "Australian Bush Medics' by Gordon Newton (2013), making a TV appearance on 'Colour In Your Life' with Graeme Stevenson (on 4ME Australia) and being the creator of 'Adult Therapy Colouring in Kits & Workshops' which proudly support Beyond Blue, an independent non-profit organisation working to address issues associated with depression, anxiety disorders and related mental disorders. Raised by a biologist and a journalist in the forested stretch of northern Wisconsin, Christopher Hagen, received a BFA in Digital Art & Photography from the University of Minnesota Duluth. Becoming deeply involved in printmaking during that time, he took a journeyman’s path through Minneapolis, completing a professional internship at the Highpoint Center for Printmaking. In 2012, Christopher undertook study with Illinois State University, and completed his Master of Fine Arts degree in 2015. He attended the Tamarind Institute of Lithography in 2013 to further his printer training, and has since served as a printer for Normal Editions Workshop in Illinois and Northern Prints Gallery, Duluth. Now based in Brisbane, Australia, Christopher teaches printmaking at the Queensland College of Art and the Brisbane Institute of Art. Christopher's work has been exhibited throughout America, Australia, Greece and Egypt; and his work is held in collections at the Skopelos Foundation for the Arts (Greece), Limerick School of Art & Design (Ireland), Illinois State University (Illinois, USA), Northern Prints Gallery (Duluth, USA), University of Minnesota Duluth (Duluth, USA), Kendall College of Art & Design (Minnesota, USA) and El Minia University, Egypt. Claudia Husband is a practicing visual artist and textile designer currently residing in Brisbane, having studied printmaking in Australia and America. She completed a Bachelor of Fine Art with Griffith University’s Queensland College of Art (QCA) in 2012, and attended the Tamarind Institute of Lithography in Albuquerque, USA in 2013 to further her studies in lithography and collaborative printing. Until recently, Claudia was one of the only printmakers in Brisbane teaching the medium of lithography to artists outside of tertiary institutions, and has mentored many emerging artists at the Queensland College of Art and through Brisbane’s local artist run cooperative, Impress Printmakers Studio. Claudia's work has been exhibited in Australia and America; and currently has work in collections at the State Library of Queensland, Griffith Artworks, QCA Printmaking Department, Northern Prints Gallery (Duluth, USA), The Skopelos Foundation for the Arts (Greece), Magnani Papers Australia and private collections in the UK, USA, South Africa and Australia. With this new insight I set off on an incredible journey of discovery both of myself and the craft of painting. I discovered that my chosen field, as with life, was one of continual learning. It’s like the “carrot and stick” routine – you never quite “arrive” but you have to keep on trying. Learning can happen by watching and listening to those who have trod the path and it can happen in solitude. Some of my greatest insights into understanding colour have come simply by experimentation and often by accident. From the very beginning of time we see this again and again – caveman, storm, lightning strike, fire. I’m often asked for advice on how to progress with an art career and my answer would be to never stop learning. Even someone who is well and truly “up there” needs to move forward not stagnate in their processes. To leap into the unknown every so often is good for the soul, all be it sometimes terrifying and confronting. Whenever you go into a new learning environment, go with your mind open and your receptors on high alert. Go with a sense of eager anticipation and expectation, not with fear and dread. Nervousness is okay, but harness it as a positive energy not a negative one. Rise to the challenge of stepping outside of your comfort zone and go on a voyage of discovery, even if the end result is the discovery that it is not the direction in which you want to go. You have allowed yourself to put in place one more stepping stone of your life’s journey. Always remember that a perceived failure is simply paving the way to success and a deeper understanding of yourself. James has been painting in watercolour for over 25 years and has exhibited his work in galleries throughout Australia and Southern Africa for the last 10 years. James was born and spent most of his life on a farm in Africa where he started to paint scenes from the farm and African life. After moving to Australia some 14 years ago he fell in love with the Australian landscape particularly the old farms, the warm soft colours and the light. This inspired him to paint more seriously. He paints loosely in watercolour using wet into wet techniques “the faster I work the more feeling the painting has”. He doesn’t paint to sell but more what catches his eye or portrays the feeling of a scene. He feels a deep connection with the land and nature. with others. As a result he teaches workshops and joins or creates painting groups where ever he goes. Jan Lawnikanis has taught regular art classes on the Gold Coast for the past 22 years and tutored over 70 workshops in various locations around Queensland and NSW. Students in all mediums have praised Jan for her teaching skills and this has gained her an excellent reputation with all ages. In her personal art career, Jan’s beautifully presented work in various mediums has won many first prizes and other awards. Her commissions range from school theatre sets to a set for the QLD Conservatory of Music, 40 artworks for an apartment building, 15 artworks for an office floor, paintings for a restaurant as well as school murals and private works for client’s homes. Jan has been the featured artist in Australian Artist Magazine, with 5 full-length articles on using coloured pencils. Other publications include the Paradise Magazine-GC Bulletin, Art Newsflash, the International Watercolour Institute catalogue, the Coloured Pencil Magazine and the Australian Coloured Pencil Network. For me painting has been an evolutionary process, however the opportunity to paint did not present itself until the early 2000’s when I enrolled in a local Tafe course and from there a succession of completed studies ensued including Certificate II Visual Arts and Diploma of Visual Arts (Fine Arts) at Cooloola Sunshine Institute of Tafe, furthermore 2015 saw me finish a Fine Arts Degree with Curtin University. During this time I also had the opportunity to exhibit work in a variety of local Galleries as well as co-coordinating a couple of local art shows and in addition to that show my paintings in a range of exhibitions and competitions throughout Queensland, interstate and most recently, an exhibition in Florence Italy. I’ve also held the position of Gallery Curator at Yandina Historic House for a number of years, giving me the chance to work with other Artists, organize and present artwork and become involved in a variety of local community events. Additionally I have had the good fortune to organize and run several children’s art workshops, and implement some art projects in a local primary school. It is all these artistic opportunities that have helped me gain a better understanding of art making and in doing so have given me the direction and inspiration that I have needed. As long as I can remember I have had a keen interest in animals and art. Drawing, tracing and cutting out pictures was an important pastime when I was young, and as the years past my interest grew and finally evolved into the arts practice I have today. Describing my work is easy it’s always been traditional realism and the natural world. For me the animal kingdom is the driving force behind my art as I love to delve into the diversity of animal life. My intention is to capture my subject’s character and expression, incorporating their humour, their majesty and wonder, and as a result, the painting then tells its own story. Paul has been teaching and tutoring for over 30 years. His workshops have ranged from U.S., Hong Kong, Japan and all over Australia. Paul takes great pleasure in showing his students a different technique using any water based paints. He tries to give the students a fun workshop and not have them feel uptight. Students seem to adapt well to the airbrush in the beginning and it is very hard to get it out of their hands by the end of the workshop. He’s had many compliments on the way he handles his students and is very patient. the very next year won first prize for the best painting. making his international career blossom. the first Australian wildlife artist to have a solo exhibition in Hong Kong. In 2009 he released his second book “Away With The Birds”. in the 'Wildlife Art Museum of Australia' book launch at the Sofitel Hotel in Melbourne November 2014. He’s had many compliments on the way he handles his students and is very patient - you will love his style of teaching! Natalie is an illustrator and graphic designer from Melbourne. Whilst Natalie has worked for some of the big names in retail (Rip Curl, Patagonia, Lalaland to name a few), it is her dreamy contemporary botanical and animal watercolour illustrations which have been selling through a fleet of retails stores and online that caught the attention of Artable. Natalie takes the watercolour medium to a new level, with bright, punchy colours and clean crisp backgrounds. Natalie has been teaching her skills through workshops for some time and is flying up to the Gold Coast to share her skills with you. Drawing inspiration from anything and everywhere, Natalie’s greatest influences are storytellers; Enid Blyton, Dr. Seuss, Tim Burton, Walt Disney, just to name a few. Other things that tickle her fancy are people watching, liquorice, travelling and daydreaming. She works between the Surf Coast and Melbourne, enjoying the best of both worlds. Originally from Canada, Brittany Partington is now a local teacher on the Gold Coast. Brittany is passionate about bringing out the creativity in people of all abilities, allowing individuals to discover and enjoy the process of creating artworks. She believes that art is an avenue for people to connect, express, and have a bit of fun in the midst of the ‘busy’. Brittany has explored the use of different mediums such as acrylics, watercolour, photography and bringing recycled wood into some of her designs but brings her amazing personality to our 'Unwind with Watercolour' events where she works with students to use art as a way to relax and explore creativity at the end of a busy day. “My career in illustration began as a labour of love and blossomed into something bigger after I started pursuing my vision to reawaken the sense of wonder, imagination and the inner child in all of us. I was lucky enough to grow up in Byron Bay; surrounded by rainbows, animals and carefree vibes! My collection of hand drawn illustrations takes inspiration from my childhood and nature, featuring a whimsical, bohemian and intricate twist to each piece. I love blending different mediums together to create something unique and colourful. When my work brings a smile to children and adults alike, I know I’ve achieved my dream! With so much detail, there’s also an incredible amount of patience and love required, but this is my favourite part as I find it quite meditative and enjoyable. Many newer pieces in the collection take between 30 - 40 hours to complete! Some pieces have hidden intricacies for you to discover each time you look! Other pieces even glow in the dark! One thing is for sure, every artwork has a story and special meaning behind it!" Clair Bremner is a professional artist based in the Yarra Valley near Melbourne. She has been working as a full time artist for the past four years creating abstract expressionist landscape paintings and expressive florals in acrylic. Clair is a largely self taught artist but I’d complete a Diploma of Visual Art in 2004, she is primarily inspired by nature and the natural tangle of vegetation near her home in the bush. She is represented by Bright Art Licensing and has created artwork for companies such as Hallmark, Andrew McMeel Publishing, Soho Myriad and Victorian Racing. Her artwork has been featured in Home Beautiful, Art Edit Magazine and on the cover of Breathe Magazine and can be purchased from a few select galleries around Australia. Clair has been teaching acrylic workshops for the last two years in her studio and in other locations around Melbourne and is looking forward to bringing her class to Queensland. Cherry hood is an Archibald Prize winner who has artworks in many important Australian art collections, including the Art Gallery of NSW, National Gallery of Australia, Artbank, and several regional art galleries. Cherry has become well known for her haunting, large-scale images of faces. As viewers, visiting a Cherry Hood exhibition is a voyeuristic experience. The huge eyed faces follow you around the exhibition space, drinking you in and forcing you to maintain eye contact. You feel as though you have intruded on quiet thoughts, perhaps on a dark moment recalled. There are no smiles, and the eyes have a bruised outlook, too knowledgeable for their brief years. Cherry Hood attained a Master of Visual Art at Sydney College of the Arts. Her thesis investigated gender politics in art and cultural mores and taboos surrounding the representation of the male body. After high school Hood attended art school at St George Tech for two years without finishing her diploma, she then went to Italy for six months to study Sculpture and Italian language. Hood was inspired by her teacher at St George, the famous sculptor Bert Flugelman. Hood returned to art education as a mature age student in 1991 and spent 3 years studying painting at the National Art School, she continued her study at Sydney College of the Arts (University of Sydney) and attained her Undergraduate and Honours Degrees before attaining her Masters of Visual Art. Hood continues to be passionate about art education often describing her experience at Art School as a “gift”. She tries to give back a little by teaching and conducts workshops and gallery talks. During her 20-year painting career Hood has had countless solo exhibitions and is often included in group and theme exhibitions at museums and institutions. Hood has exhibited in the galleries which represent her: Tim Olsen Gallery in Sydney, Heiser Gallery in Brisbane, Turner Gallery in Perth and Greenaway Gallery in Adelaide. Hood has also had solo shows in New York, Los Angeles, San Francisco, Toronto, Vancouver and Zurich. Her works are in many private collections in Australia and overseas and many of the State Museum Galleries in Australia have collected her works. Her works are very well represented in major corporate collections. Hood works in the unlikely medium of watercolour, her paintings are most frequently anonymous composite portraits. Since her move to the Southern Tablelands of NSW Hood has embraced the landscape and sometimes incorporates it into her works. Hood was the winner of the 2002 Archibald Prize, the most prestigious painting award in Australia, with her portrait of the young pianist Simon Tedeschi. Hood was one of seven women winners in the long history of the award. Hood had been a finalist the year before with her very first entry in Archibald Prize. The work -a watercolour on paper -of her brother in law the artist Matthÿs Gerber was remarkably the first watercolour on paper to be hung in the Archibald. Later Hood painted David Helfgott, Ben Quilty and in 2010 Michael Zavros which were also hung as finalist works. I'm just a girl from a dairy farming family, I am totally obsessed with drawing, painting and art. Mainly because it soothes and stills all the thoughts that race and roam around inside this brain of mine. I see beauty and light and colour everywhere. I married my childhood best friend and it just so happens he is the greatest human I know. He keeps all of us loved and looked after, he even manages all my art and my ideas. We have four kids. They're cute in the photo but don't be deceived, they are all so alive and expressive and naughty and kind and arrrgggghhhhh! I have no parenting advice but I do love them more than I knew I could. I think if you love your kids really well that't the best example for them and others. I struggle with my art because all I want to do is paint and draw living things. People. Animals. Plants. Those kind of things. Everyday kind of people like you and me, with our love, resilience, laughter and hope. But everyday kind of people also have some mess, pain, hurt and scars. You can't have one without the other. One day I dream of voicing in an image, what is burning inside of every person in way that helps them have courage and vision for their whole life. That's the direction I want to head in. I am so honoured that you'd find my work interesting enough to follow along on the journey. I would like to write a little more so if you would like to join in, just enter your email address at the bottom of the page. Thanks for pouring courage on my ideas. We were created to create! Lara Scolari is a contemporary Australian visual artist, a creative entrepreneur and a recognised fine art expert renowned for her striking original artworks that are making a splash on the Australian art scene. A natural born artist who grew up in Sydney’s leafy suburb of Balmain, Lara was always destined to become a painter. Her mother is a painter and her father, who is a talented musician, used to work as an industrial chemist for the art brand Matisse Derivan which manufactures artist paint and mediums. Influenced by major artistic figures such as Brett Whitley, Helen Frankenthaler, John Olsen, Hans Hoffman and Mark Rothko, Lara developed her own distinct approach to the ‘abstract expressionist’ style. Lara moved to Dubbo for work in her early 20s as the Education Officer at the Western Plains Cultural Centre. While in the country, Lara proudly exhibited her contemporary abstract artworks in many solo and group exhibitions, including the Dubbo Regional Gallery and Orange Regional Gallery. Her work is now represented in public and private collections throughout the world. Lara spent 20 years in Dubbo fostering her love of art and focusing on her young family. Now residing in Balmain, Lara works fulltime from her vibrant light-filled studio, which she is in the process of converting into a stunning family home, an open art gallery and her ‘happy creative space’. Her recent body of work has been a huge success and has propelled Lara’s career into the stratosphere. Interested in how energy informs the painting and viewing process, Lara’s practice explores multilayered organic forms that create an enlivening space for contemplation and a resting place for thoughts. Inspired by memory, meditation, music and influenced by our Australian culture – an island continent surrounded by water, her eye-catching paintings feature a beautiful translucent veiled colour palette that reflects our natural landscape. An Action/Gestural painter, Lara’s work is produced in an ‘abstract expressionist’ style where a variety of media, developed experimental techniques and processes are used to create depth through exquisite transparent layers that reveal hidden dioramas. Prolifically producing strong considered bodies of work, Lara’s coveted artworks are beautiful in organic form, line, shape and composition. After working in the legal profession for 25 years Joan Blond has returned to her first love of painting. Joan is an abstract expressionist and contemporary artist based in the Yarra Valley, Victoria. Mostly self taught, Joan’s creative side was nurtured by her Mother who constantly shared her love of drawing & painting. Joan loves painting generous blocks of colour and her style is vibrantly expressionistic, often incorporating energetic line work. Joan has had 2 solo exhibitions and had works included in numerous group shows. Joan’s paintings are held by private collectors throughout Australia, New Zealand, USA, Germany and recently Hong Kong. Lyn is a 7th generation Australian and has been a professional artist of beach and landscapes for over 30 years. Lyn has a long list of awards and people who appreciate and recognise the emotional and physical truth in her paintings. Her passion is the untamed, wild and often fragile beauty of the country and coastline of Australia. Lyn had been a ballet teacher, a primary teacher and the first travelling art adviser to 12 NSW schools but her own artwork evolved, and it has become her career since 1981. No matter what her subject, Lyn searches for conditions or personal characteristics that imprint the character of an area into her memory. This character becomes the energy in her paintings. Five of Lyn’s works have been acquired for government city collections in Australia and Japan. A sixth was hung in Parliament house Canberra. With art awards accumulating since 1984, her realist/impressionistic works in pastel or oil, have a visible sensitivity coming from observation and understanding of her subjects. She has been honoured and amazed to know that among her many clients, people have travelled from Sydney, Wagga, Hong Kong and Los Angeles to her studio on the Mornington Peninsula specifically to buy her work. She loves teaching and is able to break down the painting to understandable steps. She believes that if an artist understands how to use the values of light and shade, colour, different strokes, atmosphere and textures they will be better able to paint and enhance the story that they have composed in their painting and freely choose to dispose of anything unnecessary. Online she featured in the World’s Top 13 Seascape Artists from Best of Worldwide Artists Collectors’ edition –She also featured in magazines Australian Artist, Pastel International and Australian Palette. The Australian Guild of Realist Artists have given her Life membership for service and her Fellow status represents the quality of her paintings. She is also a Member of the Pastel Society of Victoria where she has won in their annual exhibitions Best in Show, Runner Up to Best in Show, the Ming McKay Award, Best Landscape/Seascape best Waterscape and others. In 2001, Lyn represented Australia chosen as charter member and juror for www.landscapesinternational.com based in Canada. Since 1995, her history and expertise has qualified her to judge many art shows from Mackay (Qld) to Southern Victoria including the Camberwell Art Show. Lyn, was a director of the Brialyn Fine Art Gallery in Frankston but retired (2016) after five years to give her painting more time. This extra time has also seen her able to conduct travel tours and interstate workshops across Australia.